The right wheel I ordered from you in 2013 has a slipping clutch. I have tried to remove it without success. If you are having a problem in removing the clutch from the wheel, here is my recommendation for helping you remove a difficult wheel clutch. The original clutches from 5 years ago (2013) were all metal and with some corrosion, bing out in all weathers over time the screw can get seized to the metal plate of the original metal clutch body. In this case I would recommend the following in order to remove the clutch from the wheel. If the cross screws have been difficult to remove and been damaged or burred. I would first spray some WD40 on the screws this is to allow it to penetrate the hole, leaving it for a while. Then a set of mole grips across the head of the screw tightly clamped and if possible, the best fitting screwdriver for the job to fit the screw as it is. 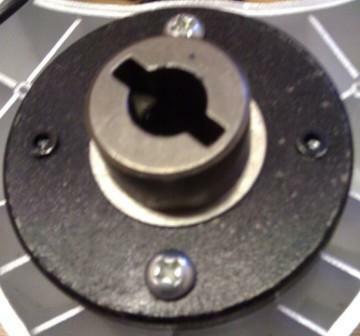 With the wheel on the ground and the mole grips attached (horizontally) to the screw. I would then lean over the screw using my weight and attempt to unscrew using both the mole grips and the screwdriver – Turning both very slowing with equal pace.